Great Barrier Island is renowded for it’s prolific native bird life. There are no possums on the Island. And of course this means more food for many of our bush birds. If you are an avid bird watcher or you just enjoy being surrounded by the bird song of Tui and Grey Warbler then Stray Possum Lodge is perfect place to stay. Set in 30 acres on native Puriri forest it is home and feeding ground for many species such as Pateke (Brown Teal Duck), Kereru (native wood pigeon), Kaka, Tui, Fantail, Ruru (native owl), Banded Rail and Finch. Great Barrier Island boasts stong Royal Forest and Bird Protection Society of New Zealand membership. There are also private ventures such as Glenfern Sanctuary and The Great Barrier Island Charitable Trust actively promoting survival of our native birds through the eradication of rats and ferral cats, which have devastating effects on bird populations. Beach care groups with Auckland Regional Council support ensure protection of our costal birds. Breading grounds are clearly marked by signs and red tape and dog restriction areas are in place on most beaches. Look out for Black Oyster Catcher, Dotteril, Herons, Terns and Blue Penguins. Tony Bouzaid of Glenfern Sanctuary offers a unique and informative guided two hour walk with the opportunity to sight the endangered New Zealand Robin which was rencently introduced to the Sanctuary in Port Fitzroy in 2005. 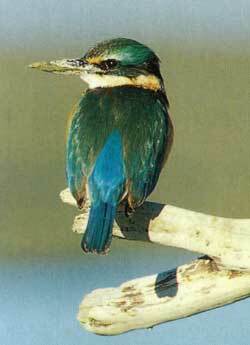 We hope you enjoy birdwatching on Great Barrier Island paradise.